recommended for: Fans of Harry Potter, Game of Thrones, Uglies by Scott Westerfeld, The Hunger Games by Suzanne Collins, and the Odyssey. People who can handle some blood. I heard of this book only accidentally before requesting a copy. So rarely is a book so undeserving of lack of hype. 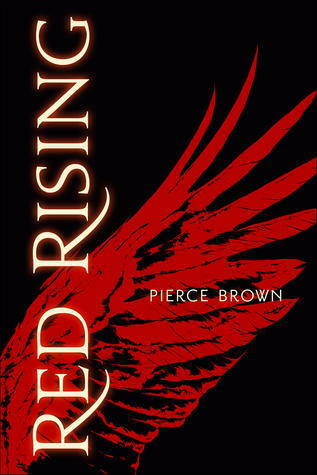 Red Rising is a revelation. It's science-fiction at its best, dystopian at its best, humanity at its best (and worst). It's a world in a distant future where Earthlings have claimed the nearby planets, where eugenics has created social classes bred for their roles, where obedience is mandated. A terrifying world that seems in ways just an extreme version of our own. I found Darrow instantly likeable. He's thrust into a war he barely understands, forced to become the enemy in order to destroy them. It was harrowing for me as reader, watching him shattered and rebuilt in every possible way. First Darrow must abandon home and become the enemy; then he must fight a makeshift war to prove his greatness. When school is literally a battlefield, what comes out is someone stronger and more ruthless. Brown highlights that no one can come through war still innocent; that peace cannot be used against those who do not understand it. I was emotionally devastated through each part of Darrow's journey--each betrayal, each death, each hesitant friendship. I came out feeling as wracked as though part of me had been to war too. Brown's beautiful language and masterful storytelling captured me quickly, and gave stark clarity to one of the most powerful pieces of young adult fiction--of any fiction--I've ever read. The book is aptly divided into sections highlighting each stage of Darrow's transformation. We meet him as the cocky Helldiver, pride of his clan, pioneer. His people, the lowly Reds, live in abject poverty, but believe that their struggles to terraform Mars are the last hope for the citizens of a dying Earth. Only when Darrow's wife martyrs herself and Darrow is captured by the rebel Sons of Ares does he understand the depth of their delusion: Mars is habitable. Has been for hundreds of years. And the Reds toil and die young underground simply to support the higher Colors who live in the sun. At this point, Darrow has lost everything: wife, life, and peace. His rage propels him to accept the rebels' plan, to become a Gold and infiltrate the highest ranks of government. To change his body into that of a well-bred Gold's, he must undergo extensive, brutally painful surgeries. Though much of this section is waiting and time lapses, it's crucial to seeing how drastically the Golds differ from the other classes. Then, the tone changes. Darrow is effectively a Gold. He's drafted into the Institution, a prestigious academy where young Golds test their mettle and come out with apprenticeships to the most powerful people in the solar system--or fail. Only the test is literally a battle; each House has a fortress, and the winner is the one who captures and subjugates them all. This section was the most compelling to me, the most ravaging. In an effort to blend, Darrow's own cockiness and ambition come out. The lines between the mission and Darrow's own pride are blurred. It made me more invested because Darrow wasn't just seeking victory for his mission, but also for himself. The war is absolutely fascinating. You get the best of medieval and modern warfare, with spies, slaves, guerrilla tactics, and charges. And Brown doesn't hold back when it comes to violence and grit. Through it all, what kept me captivated was the human element. Darrow's position forces him to befriend his Gold classmates. What begins as necessity develops into real relationships that complicate Darrow's allegiance to the Sons of Ares. I can't express how insanely well-done the Institute war was, how satisfying the ending. We have all the conceits of dystopian satisfied: a powerful ruling class, a manipulated underclass, a totalitarian government. All this nested within a fascinating sci-fi world where Earth's empire stretches across the stars and its masters rule absolutely. It sets up an easy conflict between the powerful and the oppressed that makes Darrow and his Reds instantly sympathetic. However, Brown doesn't allow for a simplistic good and evil. From the beginning, we know that the Golds are the overlords, the enemy. The Reds are the oppressed. So we have a clear conflict, until our hero Red becomes Gold himself. Immersed in the Gold world, Darrow (and the reader) meet young Golds who are lovable, fallible, and relatable--as much products of their upbringing as Darrow. Some are cruel and sadistic; others kind, self-sacrificing, not nearly the stereotypical overlords. But all destined to be enemies by their birth. The depth of characterization given to the Golds promises that for both Darrow and reader, choosing a "good guy" is never easy. Darrow himself is driven to acts of atrocity, tarnishing the possibility of a "pure" hero. These conditions are perfect for a deep, truly human exploration of good and evil, of structures that become shackles. Darrow is a deeply complex hero. He's arrogant, hotheaded, and ruthless, but also compassionate, loving, driven. His selfishness drives him to some of his greatest victories and most desperate defeats. I loved him even when I hated him. Tragedy spurs him into a heroic role he never wanted. He first accepts it because he has a strong sense of duty, then embraces it when he learns the dark truth about his homeland. I loved watching him grow over the course of the book from a cocky Helldiver to a ravaged general and spy. He does unforgivable things but, instead of disliking him for it, I found myself questioning the system that drove him to it. The rest of the cast is equally deep and gray. I didn't like Eo that well because she seems to exist only as a symbol, but the other characters are much more real--and in each of them, we see how the hierarchy has failed them. Mickey the Purple, vain and pampered but plagued by artistic demons. The other Golds are the most interesting. They've been groomed for leadership and told they're special. They've grown up believing that the system is good, that they deserve their luxury. Yet at the Institution, their world becomes as cruel and painful as Darrow's. They are pruned ruthlessly and dispassionately, as one would prune a tree. Some rise to the challenge with cruelty and excitement; others feel betrayed by the superiors who promised them greatness. Mustang, Pax, and Cassius are the most prominent, and also my favorites. Mustang is vicious, brilliant, and also oddly selfless. Cassius is driven by a self-destructive ambition, but his superiority is clearly a fragile thing. Then there's Pax, loyal to strength and fiercely loyal. I can't forget the Proctors, obvious symbols of uncaring Gods, who pull the strings like puppet masters. The compassion with which Brown reveals all his characters promises for some devastating choices in the next books. In the Institution, Darrow could ally with them freely. Outside, they are the enemy again. Who knows where the cards will fall? I will start by saying that the narrative is in first person. Given Darrow's lowly upbringing, I find it pretty unlikely that he would speak so eloquently, unless this is a retrospective report. However, that said, the writing is one of the crucial elements to Red Rising's success. Another author could have written this same story without making it nearly as impactful. But Brown's style is lyrical. It calls to mind the myths he alludes to so often. It pulled me in like a beautiful song and immersed me even more in the experience. Brown has the perfect balance of description and metaphor to make a story that reads like an old epic, and leaves you with lingering chills. It's a long kind of book. A lot happens, too. It's difficult to fit so many months into a coherent narrative. Brown does it mostly well. The first part felt slow to me for some reason. Perhaps I was uninterested in Eo. Perhaps it could have been sped along. It soon picked up. By the time Darrow meets the sons of Ares, you're whipping along at a pretty good pace. The cover? Not great. I'm underwhelmed. A devastating epic with deeply believable characters and white-knuckle adventure; dystopian at its best. Yes, yes, yes! Reading your review just gets me exited about the book all over again. I agree with you, I could have went on and on about every little thing I loved about this book. I really hope it gets a lot of recognition. Fantastic review!